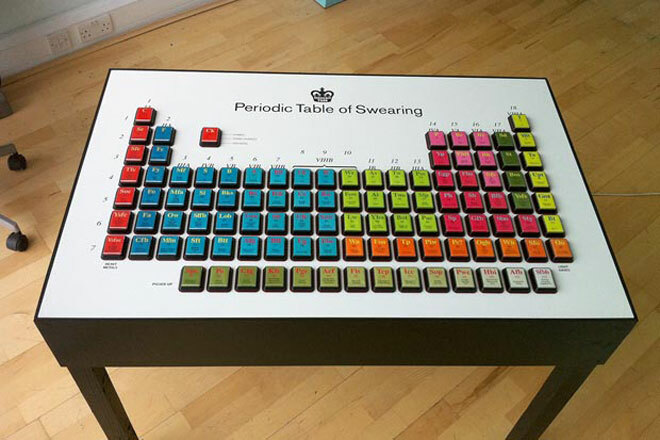 Clay Interactive has produced an interactive Periodic Table of Swearing for Modern Toss. (They sell prints of the table, and even a tablecloth version). According to Clay, "It was built in our Hoxton Street studio during our summer holidays. It's constructed from over 100 buttons, CNC'ed and laser cut MDF, direct to media printing, over 100 meters of cabling, over 300 soldered joints and a whole lot of swearing!"